Chairman emeritus, Julian Bond, of the NAACP said the tea party is “admittedly racist.” Mr Bond, I challenge you to show us the video, article, facebook post or the tweet in which the tea party admitted it is motivated by racism. As a black tea party activist who has participated in over 400 tea party rallies, I am confident that your claim is bogus. Therefore Mr Bond, you sir are a despicable liar, severely compromising your image as a statesman. You and your ilk purposely inspire hate in low-info black voters against tea party patriots who simply said no to Obama's socialist agenda and trashing of the Constitution. Shame on you Mr Bond. Remember when NAACP president, Ben Jealous said he saw tea party protesters carrying signs which read, “Lynch Barack Hussein Obama” and “Lynch Eric Holder”? Rush Limbaugh appropriately calls the NAACP the NAALCP. The “L” is for liberal. Blacks who are Conservative – who bypass government programs to achieve success and who love their country are on the NAACP and company's excrement list; targeted for destruction. 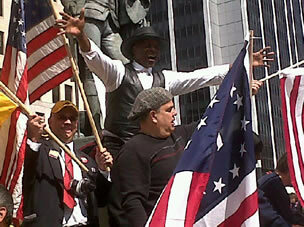 By the way Mr Bond, I am the black singer/ songwriter who penned the “American Tea Party Anthem.” Check it out on Youtube. It has a great hook! God bless. As a black tea party activist who has participated in over 400 tea party rallies, I am confident that your claim is bogus. Therefore Mr Bond, you sir are a despicable liar, severely compromising your image as a statesman.